Okay! The 2015 sailing season is officially over for the Blue Moon, if not for me ('other peoples boats'). For the record, we did more sailing this summer than ever before. I didn't quite reach my goal of sailing every week, but almost (there was a long stretch in August that was hot, hot, hot with practically no wind.) My new bowsprit and jib handling gear were a big success. I didn't go on any long cruises because of work commitments, but all in all, a great sailing season. Normally, I don't lay up the Blue Moon until November, but it has been 5 years since Bob, Helena, and I painted her stem to stern in Steinhatchee, Florida, so the time has come for The Big Refit. I've tried to keep up with the painting required by every wooden boat while she's been afloat, but realistically, there is only so much you can do on a mooring or even at a dock. So I've decided to pull her out of the water early so I have all autumn and all spring to paint, paint, paint. By the time I splash her next year, she should look great. No, she will look great. Here she is on the hard, hauled out just yesterday. I've stripped everything possible off the deck because I'll be tackling the deck this fall, and the hull (the easy part) in the spring. Her bottom was getting pretty gunky by the end of the season, so I was a little worried I'd see some worm holes after the guys power washed the bottom, but actually she looked great. The bottom paint was getting a little thin, but there was still plenty left to fight off any hungry marine boring worms. No sign of nasty critters at all, so that was a big relief. Most importantly, I've had the mast taken out for the first time ever. I've climbed up the mast several times to replace halyards and rig extra blocks, but I've never seen the top of the mast. I couldn't help wondering if all the paint was worn off from the sun, and rain was just pouring down into the grain, rotting it away from the top down. So it was a huge relief to be able to take a look at that mast top for the very first time. As I hoped, the top of the mast is heavily fiberglassed. Even the paint is mostly intact. So, no water intrusion, no rot. But definitely time for some TLC for the standing rigging, and several coats of paint for the mast itself. As a side bonus, I got to see a view of the bottom of the mast for the first time. 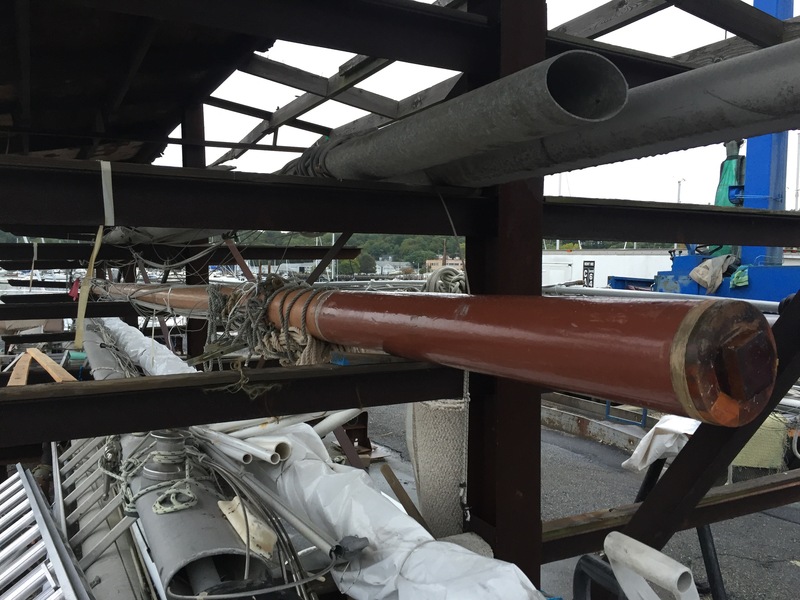 The Blue Moon's mast is stepped on the keel, so a very traditional approach to the mast construction. 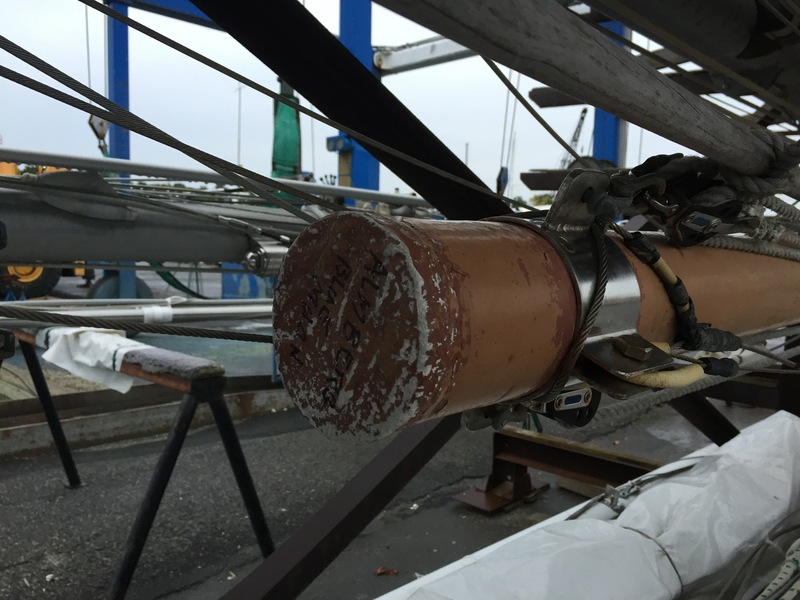 The mast is strongly fiberglassed and the bottom of the mast looks, literally, as good as new. So, at least one part of the boat that doesn't need work! Good to know! One thing that struck me as funny is looking at how the paint on the mast has faded above the deck. What's funny about that? 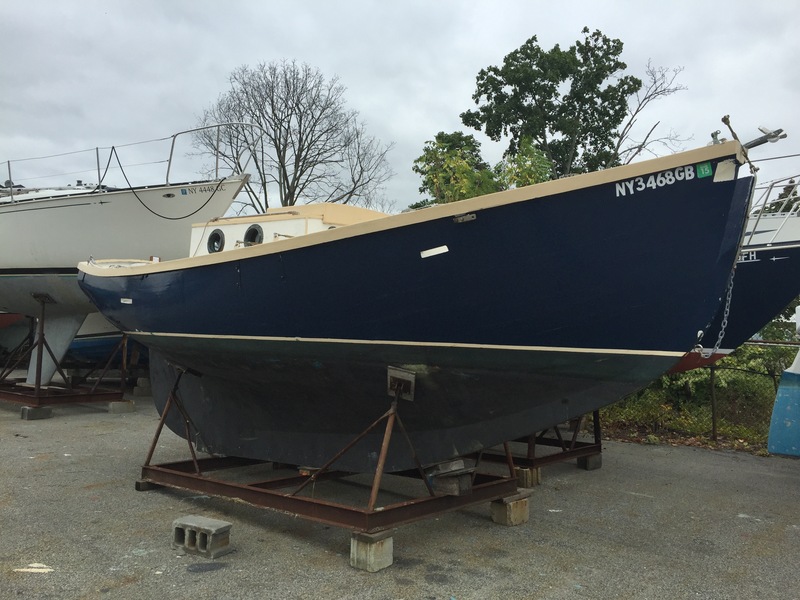 When it came time to paint the boom, gaff, etc., a couple years ago, I went to great lengths to match the color of the mast. The faded part of the mast, that is. Since I plan to work on the Big Refit as often as I can this fall, and want to record lessons learned (there will undoubtably be many) as I go along, I will break somewhat from habit and post short posts, more frequently. Maybe I won't get quite so far behind as usual! Well, we sailors must live in hope. I reckon that the paint fading above deck is from the sunlight getting to it there, but not belowdecks.